In simPRO, you can use tasks to keep an interactive to-do list for quotes, jobs, customers, and internal needs. A task can only be assigned to one person, and that person receives emails and simPRO alerts for key dates and updates. If you would like additional people to receive email notifications about the task (including customers), add them as stakeholders through the task's Stakeholder tab. Stakeholders do not receive alerts in simPRO. A customer must be associated with every task. They do not receive any emails or alerts about the task unless they are also assigned as a stakeholder, but are able to view task details if they are using the customer portal with the Tasks menu enabled. If you wish to create an internal-only task, such as 'Update emergency contacts', create a customer card file for this purpose, such as 'Internal tasks' or your own company name. To view only tasks assigned to you, go to Tasks > View. To view all tasks in the system, click the icon next to Search. Alternatively, view tasks in the card file of the customer they are associated with by going to History > Tasks, or in the job or quote they were created in by going to Details > Tasks. If you frequently carry out the same set of tasks for certain types of quotes or jobs, you may wish to use task templates to save time. Hover over Tasks, and click New. A new window opens. Select the Billable and Show on Job Card check boxes as required. Enter a Description and Notes as required. Notes are for internal use only. Under Associate with a Customer, search and select a Customer (see note below) and enter other relevant details. If required, search and select a Project No. This makes the task visible within the selected project, and on the project's job card (if Show on Job Card is selected above). Enter a Start Date, a Due Date, or both. The Start Date is when the person assigned first receive an alert; if no date is selected, no alerts are sent. If required, enter the Estimated time required. Under Internals, select a person the task is Assigned To. A task can only be assigned to one person. Select a Priority, Status, and Category as required. The default priority is 'Medium' and the default status is 'Pending'. Find the people you wish to add as stakeholders, and click their names to assign them to the task. Repeat as necessary. When you assign a task to another person, you are automatically added as a stakeholder. If required, add attachments through the Attachments tab. Each task must be associated with a customer. If you wish to create an internal task, create a customer for this purpose, such as 'Internal Tasks' or simply use your own company name. Open the quote, job or customer card file, or create a new one. For a quote or job, go to Details > Tasks; for a customer card file, go to History > Tasks. Alternatively, Use a task template in a quote or job to quickly create multiple tasks that you frequently carry out for certain types of jobs. To learn how to set up task templates, see Task Templates. Follow the rest of the creation process above from step 2. Creating a task from within a quote or job automatically populates the task's Associate with a Customer fields with the relevant customer information. You can manually edit the customer details if required. The number of open tasks also appear as a notification in brackets in the Details > Tasks sub-tab. Learn more in View an open task count in a quote or job. After clicking Save in a new task, or opening an existing task, the Notes and Dependencies tabs are visible. If a task is particularly complex, you may wish to create a follow-up note as a reminder for activities or actions that still need to be finalised. Open a task, or create a new one and click Save. Enter a Subject and Note as required. Select a Follow Up date if required. Select a person from the Assign To drop-down list if required. Click a note to edit it, or click the icon then click OK to delete notes as required. Dependencies are sub-tasks; tasks that should be completed to complete the original task. For example, if a task is called 'Get council approval', the sub-tasks may be 'Call council', 'Arrange council visit', 'Submit council form' and so on. Dependencies may be useful when teaching someone a standard process. If you just want to explain the process of a task without creating separate dependencies, simply list the details under Details > Description. Dependencies do not need to be completed for the original task to be marked as complete. It is best practice to keep your processes streamlined. Dependencies can be useful, but you may wish to be cautious of over-administration. If required, select a different Parent Task from the drop-down list. The new dependency is listed under the parent task's Dependencies tab. Click Create Dependency. A new window opens. Enter the dependent task's details. Click Finish. The window closes. Edit a task to change any of its key details, including its Priority, Status or Category. This can also be done using the bulk-manage options. Go to Tasks > View, or another task list as required. Click the task you wish to edit. On the task you wish to delete, click Options > Delete Task. Select the check boxes of the tasks you wish to delete, or select Select All below the tasks list. Click Delete below the tasks list. When a task is assigned to you, you receive an email summarising the new task. When the task reaches its start date or becomes overdue, you receive an alert in simPRO. Alerts only appear to the person the task is assigned to, and do not appear for stakeholders. Click the red Alerts icon at the top of the screen. If a task alert is visible under the Tasks section, click its task number to open and view it. Read the task Subject, Description and Notes for the details you need to complete the task, and view any relevant Attachments and Dependencies. Save additional Notes if required. You can also view open tasks in a quote or job using the notification number in the Details > Tasks sub-tab. See View an open task count in a quote or job to learn more. Recording the actual time taken to complete tasks is most useful for billable tasks, where it carries over if the task is used to create a job. Recording time is also helpful for monitoring productivity and planning future work. You can use the built-in timer to record time as you complete a task, or manually enter the actual time afterwards. Next to Actual Time, click Start to start the timer. When the task is complete, click Stop. The time recorded by the timer is cumulative, so if you leave the task and come back and use the timer again, it adds to the time already recorded. Under Actual Time, enter the hours, minutes and seconds, as required, the job took to complete. Once you have completed a task, you need to mark its status as 'Closed'. Open the task and go to the Details tab. 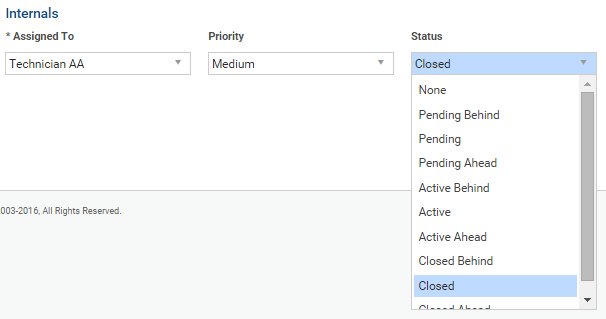 Under Internals, select Closed / Closed Ahead / Closed Behind from the Status drop-down list as applicable. You and any assigned stakeholders receive an email notifying you that the task has been closed. The task is no longer be listed under Open tasks in Tasks > View. If you have a number of tasks to mark as complete, you may wish to use the bulk-manage options. Use a range of filters to narrow down the tasks displayed. For example, you may wish to view only tasks assigned to or created by a certain person. Go to Tasks > View. Next to the search bar, click Advanced. Select an option from the drop-down lists under Filter by, such as Status. The task list update accordingly. You can then click the icon in the top right of the table to export the filtered results, or save the filter options as a saved search to access a particular task list more quickly. When you filter tasks by Stakeholder, you can only view stakeholders who are employees or contractors. You can modify the Tasks table view to include or exclude information about a task, as well as change the order of the columns the information is presented in. You can then view the fields of information you include when you click the icon in the top right to export the Tasks table, as well as when you access tasks in jobs and quotes. Hover over Tasks, then click View Tasks. Select the fields you wish to include in the Tasks table. Clear check boxes for fields you wish to exclude. You cannot exclude the Order and Task No. fields. Click and drag the icon on fields to reorder of their columns in the Tasks table. You cannot reorder the Show Descriptions or Show Notes fields. Modifying the table view changes the settings for all users. It is recommended that you use security groups to restrict modifying table view permissions to specific employees. Use bulk-manage options to change multiple tasks' status, priority, and category; or to change the person they are assigned to. Select the check boxes for the tasks, or click Select All below the task list. Under With selected, select an option from each of the drop-down lists as required. Select the check box for the task you wish to convert to a job. You can select multiple tasks to create multiple jobs. The task is deleted, and a new job created using the task's details. When working in an individual cost centre in a quote or job, the sub-tab only displays the number of tasks open within that cost centre. When working in the quote / job overview, the sub-tab displays the number of tasks open for all cost centres in the quote / job. Try Walk Me Through, our step-by-step guidance tool, to create a task. In simPRO, go to Help > Walk Me Through and search Create a Task (ID: 110231).